Ramat Gan, Israel - A religious Jew from a Chabad family in Givat Shmuel was killed today at the Ramat Gan delivery service he ran with his brother. A former Arab employee he had dismissed came back to the office, and following a dispute, pulled out a knife, stabbed his former boss and fled the scene. 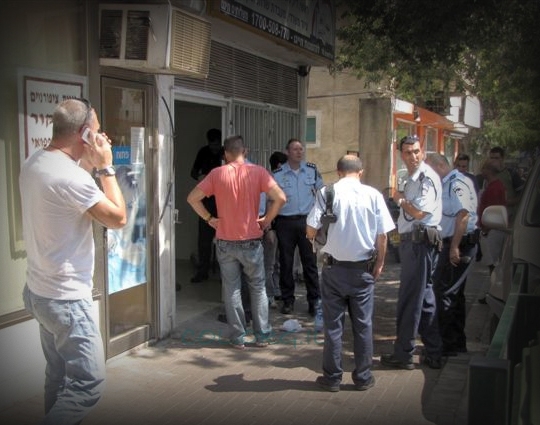 The victim, Dotan Natanel Mangami, Hy”d, 33, had planned to move to a new home with his two small children and pregnant wife, but those plans came to an abrupt end with today’s knife attack. 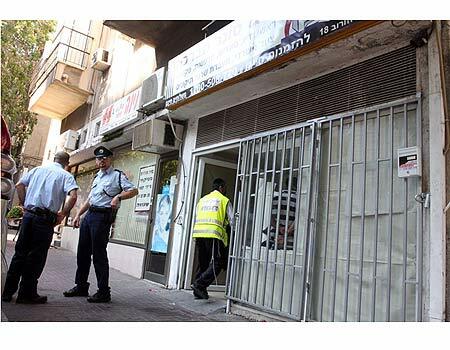 At first Magen David Adom paramedics managed to stabilize him and evacuate him in critical condition, but later he succumbed to his multiple stab wounds. The identity of the 20-year-old assailant, who had worked as a deliveryman, is known to police. After the family was notified, relatives gathered in the family home in Givat Shmuel, a small city located between Ramat Gan and Bnei Brak. “He wasn’t the eldest son, but he was the most dominant one in the family, like a big brother to his 12 brothers and sisters,” said the deceased’s brother-in-law, Yitzchok. “He used to keep everyone entertained and helped everyone financially. This is a real tragedy for us.” According to family members the widow saw her husband lying in a pool of blood, and since then has been unwilling to speak to anybody. This afternoon police requested an autopsy, but following intervention by ZAKA’s legal department the police agreed to a regular external examination. The levaya was held this evening (Monday). The niftar is survived by two sons, ages two and three-and-a-half, and a wife in her sixth month of pregnancy. Imagine if it was a jew that stabbed an arab to death. It would be headlines in every newspaper and news sites. The Israeli government would be falling over their feet apologizing. Condemnation would be heard from Israel and every country in the world. What a stupid comment. These kind of revenge attacks by angry ex-employees happen all the time and in most cases, its jews who attack their former jewish employers. Don't make such blanket statements about "arabs" since the economy of EY would grind to a halt tomorrow without arab labor. To #3 you prob mean tov shebenchushim retzotz et mocho - to #5 when was the last time a Jew murdered thier ex-employer???? Rav Kanyevski said not to employ arabs! Theyl never catch that murder, he ran in to Gaza and its over. "Rav Kanyevski said not to employ arabs!" And did the rav also say that all the bochurim sitting in kollels without any skills or education should go out and C'V "work" for a living to replace all the arabs who he said should be fired. Your response indicates a callous indifference as well as a cold heartless compassion for 2 1/2 small children left. Yes there are many people who pull off financial scams which may lead to suicides as in the Madoff case. almost $2.000.000 to a scam artis whom I thought was my best freind. Did I ever get angry enough to want to kill him Yes- but as a civil Jew I would not. This Arab murderer shows the disregard of human dignity towards Jews. Remember, They kill their own if they sell only property to a Jew. Perhaps u also advocate one state like Jimmy Carter with this a sample of what Jews can expect like the kidnapping and SEVERE TORTURE of the French victim last year. The torture was just like this murder , influenced by their anti-semtic attitude towrd Jews. gave the PA guns that later were used against Jews by these so called PA Police. This is their Koran- "kill the infidels" Woe is the mother who has a son who cannot cry for these little Yesomim! But compares taking a life to money swindles?? “ Your response indicates a callous indifference as well as a cold heartless compassion for 2 1/2 small children left. Yes there are many people who pull off financial scams which may lead to suicides as in the Madoff case. There are plenty of people from other countries that are taking over for the work that the Arabs were used for. Israel's economy would be fine if no one hired another Arab. it would seem easier to say pay the $100, however, is this what someone should fear? that anytime theres a dispute, he should pay in fear he may get killed??!!! if you live with such fear, than dont hire an arab, or do any business with them. My heart goes out to this man's family. I can understand and appreciate the outrage. However, I don't think its fair to treat this as an "arab" issue. Fired non-arab workers in the u.s. have also committed similar senseless murders of their former employers and co-workers. “ My heart goes out to this man's family. I can understand and appreciate the outrage. However, I don't think its fair to treat this as an "arab" issue. Fired non-arab workers in the u.s. have also committed similar senseless murders of their former employers and co-workers. U are right ! but I would read comment #11 to see how certain jews react. The fact is that this has happened in Israel in a much larger proportion to any other country. This is not an Arab issue except that in Israel-Their Koran teaches that it is a mitzvah to kill an infidel"! so it is much more probable than other places due to the 70 virgins he will get as a bonus if he dies in the act!! They are all accepted as martyrs if they "kill a Jew described as a monkey in the Koran.' So of course the probabilty of these responses is much greater with the incitement he has received fro the PA since he is a child. Does that make a difference after years of indoctrination about Jews??? can u smell the coffee?? You are really out of line here...all it shows that an Arab is so stupid and coldhearted that that scumbag will kill just over a silly dispute over a lousy $100!! Stupid that for a 100 that he'll never get...and so will he be wanted for life with no employment..and he won't even be rewarded with the famous 72 lol !! Not employing Arabs all of whom have been incited to blood lust is common sense. The Gedolim including Rav Chaim Kanievsky shlit"a have ruled that it is forbidden to hire them. The economy can continue with other foreign workers and other Jewish laborers. The Gaza border is tightly controlled by IDF, how can he escape to Gaza? The West Bank is a possibility, but Israel police has a better track record of finding Arab criminals in West Bank due to their networks than finding Israeli criminals inside Israel. Didn´t you last week read about the shiite billionaire in Lebanon that made a "Madoff" and some Hezbolla-leaders lost a couple of billion $? Or about the murder in southern Sweden where a fired muslim bar worker killed his muslim former employer. What do you call the OPEC cartel, the funding of terror and laundering of petroterror money in the US by Saudi Arabia, etc, etc, etc. When is the last time you saw a self-hating Arab? does that also include the goyte ? Lots of Thai, Filipina, Nigerian, Ghanian etc as well as Ethiopian domestics available in EY. No need to let an Arab (or a non-Jewish Russian or other CIS immigrant who poses as a Jew) into your home in EY. Your statement is moronic. a) When was the last time a Jew killed another Jew for being fired? b) Israeli economy would actually improve if the jobs went to the Jews instead of arabs. Think before you make a statement. So, formally, only Jews do Madoff scams? You've been reading too much Stormfront lately. You can depend on formally to come up with some ridiculous anti Jewish comment. Why do you haunt this board? Why don't you comment on the Islamic radical or other hate sites where your warped comments will find their true home?